This book has just tickled me no end! 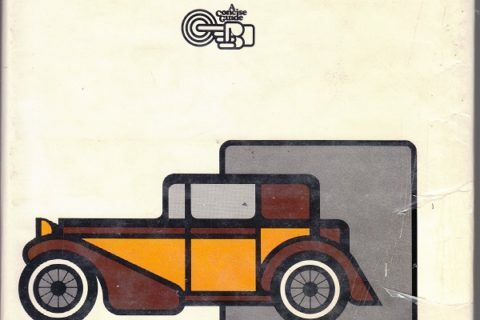 I have had a ball looking at this very old driver’s education text. What a hoot! 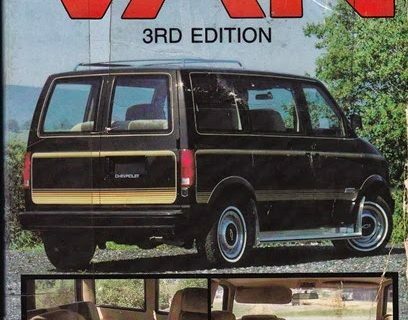 My car loving friends will certainly enjoy this nostalgic book. My secret submitter also took great care of this gem and it doesn’t look its age at all! What a find! Not surprisingly, a bunch of Michigan libraries and archives have this in the collection. (We are the home of the Auto! Go Detroit!) What I was wondering about were the dozens of public libraries and a few high school libraries that had this in a regular collection…hmmm? Safety is important! Here is a handy guide for drunk driving! (Interesting safety note: no mention of seat belts ANYWHERE in the book!) Michigan’s legal limit is .08. Can’t imagine this being very helpful for current drinking and driving! Planning a trip? Here is a futuristic map of the highway systems! Wow–it’s the highway map that I like the best. I shared it with my sons, and I’m posting it in my high school library. 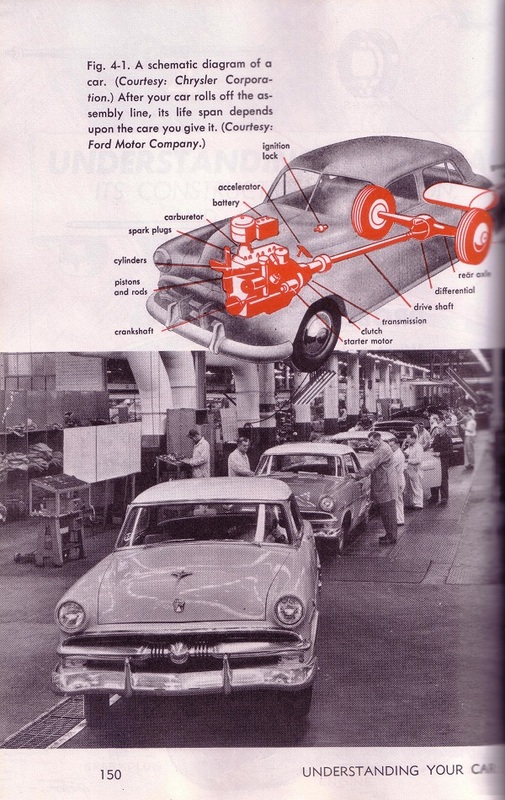 No mention of seat belts because cars did not have them until the 1960’s.I remember my mom buying a new car (probably 1966-67) that had seat belts in the back seat as well as the front. It was a new concept! I want this book! It is interesting to see how things have changed. .08 is the national limit actually, IIRC. 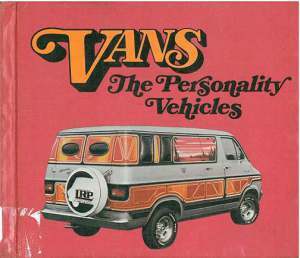 I’d actually like to read it too just because I was only born in ’81 and the older cars are strange and interesting to me. You do have to admire the alliteration in the blood alcohol chart. I just read a story in the newspaper this weekend about a driver in South Dakota who had a blood alcohol level of .708 and they were still alive! I was going to mention the same thing! How is it possible to have that much alcohol in your body and not be dead; let alone driving around. The phrase “Delighted and Devilish” totally made my day. Awesome! Any chance it says what town is featured on the cover? I recognized it immediately, and lo and behold someone actually cares for the answer! It’s the view of Sunderland MA and the Connecticut river from the summit of Mt Sugarloaf in Deerfield MA. I was skeptical about the writer’s alcohol tolerance when they listed 6 to 7 drinks as the beginning of “dizzy and drunk”…then I remembered every episode of Mad Men I’ve ever seen. Clearly the liver has evolved. “Dry and Dependable” . . .sounds like a diaper ad. 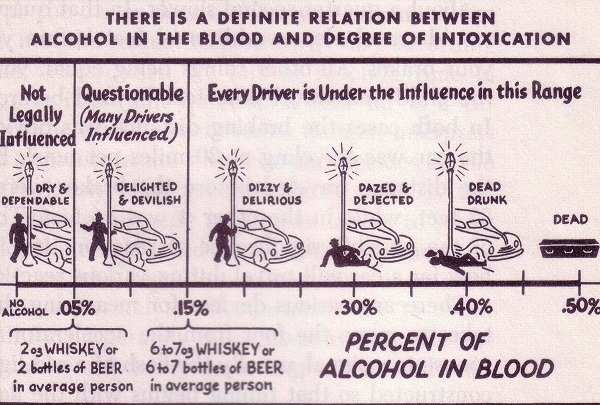 I often drive “delighted and devilish”, and occasionally even “dazed and dejected”, and I don’t even drink! I think we would all agree, though, that driving while dead is just unsafe at any speed. This is the 5th edition?! Poor me, I’m not even on the superhighway map where I live. I guess its route highway 89 for me. Love this book. 5th edition? Perhaps during the previous four they could have updated the SUPERHIGHWAY SYSTEM MAP! 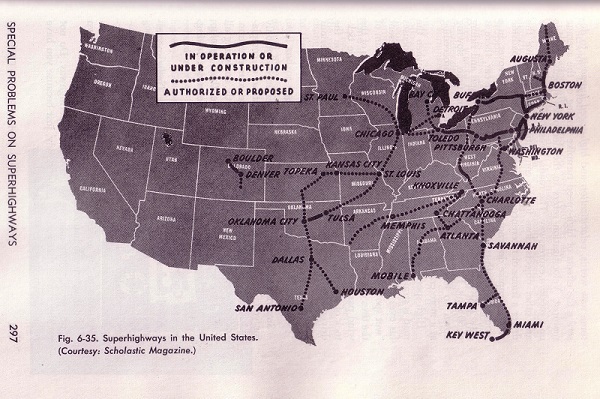 Published in 1954 — and according to the map, if I read it correctly, the only superhighways in operation in the USA were the famous Toledo-NYC-Boston-Buffalo loop, and that megalopolis necessity between Tulsa and OKCity. A mere 150 years or so after the Louisiana Purchase and Americans still haven’t thought much of settling the wild west. Oh I love stuff like this. Especially the highway map. I used to drive a semi truck. Bought a road atlas from 1963 at a household auction….fascinating to see the difference from today!! @songbirdcindi- we here in South Dakota are made of stouter stuff, I guess. I heard about that too- and now everybody here has a record they’ve gotta try & break now. Probably going to be an interesting year! No buzzed driving? Guess that term hadn’t come out yet! Keep! A recent news story reported someone registering .7 . A female, at that! 0.7% blood alcohol? I wonder was she tiny/had just given blood?? sorry – getting off topic. Love the blog! Hey, one of those guys looks like my Dad in High School! Ease up on the exclamation points there, Mary. You’ll wear them out. I like it! Very interesting. Especially on the part of handy guide for drunk driving! Its really very helpful for current drinking and driving. Safety is important! Actually, cars had seatbelts long before the 1960’s. I used to own a 1953 Cadillac, and it had front and rear seatbelts, which were stock. 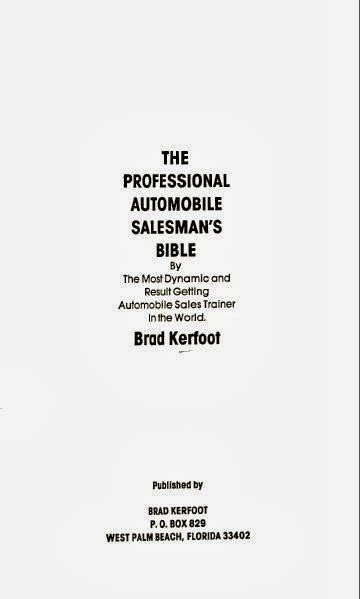 I found it interesting the popularity of the driver’s ed book,”Man and the Motor Car” on the computer! I have the fifth edition (1954) as well as the sixth edition (1962) and very fond of the books. Being a car and commercial vehicle buff, plus the information in the books about safe driving found a permanent place in my library. 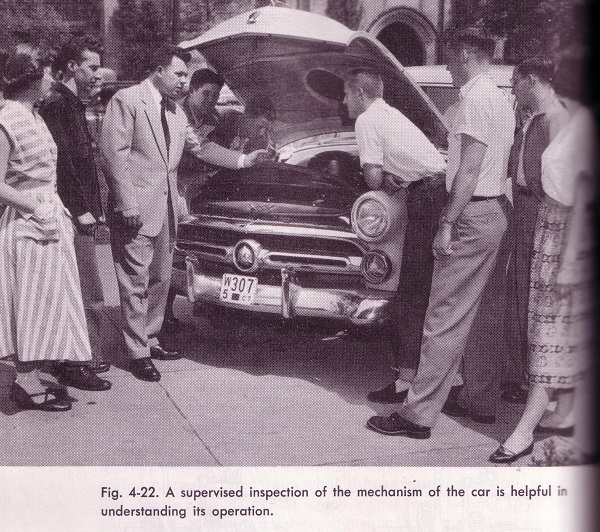 As I recall in the State of Wisconsin, Man and the Motor Car, was popular in many high schools teaching drivers ed classes. 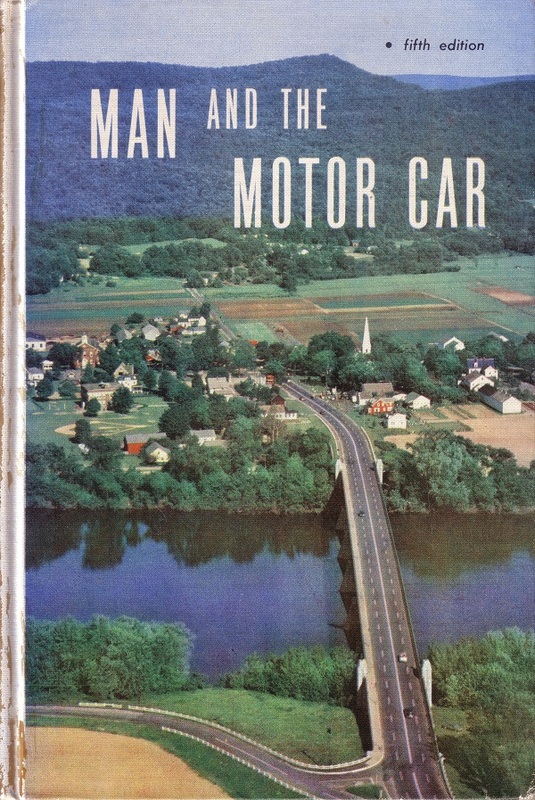 I’m sure many other school districts in other states used “Man and the Motor Car ” as well. Very interesting books to be sure.